Hauser: Dr. Dubick, can you please tell us a little bit about your background? Dubick: I’m a board certified anesthesiologist, and I’ve been performing interventional pain management full time since 1993. I’m board certified in pain management through the American Board of Anesthesiology, which is the only pain management subspecialty recognized by the American Board of Medical Specialties. I have been practicing structural medicine since 1995 and performing Prolotherapy injections since that time, after being introduced to Dr. Tom Ravin at the AAOM (American Academy of Osteopathic Medicine) annual meeting in 1994. I had been treating my patients with steroid injections for my first couple of years in pain management, but was concerned that most patients received only temporary benefits. Finding the AAOM opened my eyes to the field of musculoskeletal and structural medicine, an area that I found to be so vital in helping my patients achieve improved outcomes. Hauser: Dr. Dubick, you stated that you were traditionally trained as an anesthesiologist. You mentioned the notion of steroids and that they may not be the best treatment. Obviously the light bulb went on in you at some point. Can you describe that? Thinking outside the box is one thing. But from going from anti-inflammation to basically inflammation and structural medicine is completely the opposite. Have you gotten any flack for it from other colleagues? Dubick: Ross, it’s funny how some things happen. My introduction to Prolotherapy came from a very traditional, but innovative, neurosurgeon friend of mine who heard about Prolotherapy from a nurse who had moved back home to Kentucky. She had been living in Texas where she was involved in a serious MVA. She had been bedridden for a year with back dysfunction until she heard about Drs. Kline and Eck in Santa Barbara, CA. She flew to Santa Barbara for a year where she was treated successfully with Prolotherapy. It was just luck of the draw that this woman moved back to Kentucky, and I heard her story from my friend. In answer to your second question, yes, I believe that a number of my peers used to look at my way of thinking as being unusual, both in Lexington and in Charleston. However, results speak for themselves and many of those physicians now send me referrals. Prolotherapy was a credentialed procedure at St. Joseph Hospital while I was on the staff and is currently a credentialed procedure at St. Francis Hospital in Charleston, SC. Hauser: Marc, if you were teaching a course to your fellow anesthesiologists and you were going to say to them, “For these certain conditions, the steroid shots make sense and are a good treatment. However, these other cases are where you should consider Prolotherapy. Where would you make the distinction? Dubick: When I first started practicing in Charleston, almost every patient sent to every pain management physician with back pain had an epidural steroid injection ordered if there was any abnormal finding on imaging studies. A large percentage of those injections provided only temporary relief because the vast majority of back pain is not caused by radicular or discogenic issues. Epidural steroid injections can often be very useful for radicular pain and occasionally discogenic pain. Most of the chronic pain issues that are not radicular and are not discogenic are usually caused by a structural issue. These structural dysfunctions can often be treated with a combination of good joint mobilization, rehabilitative therapy, and proliferant therapy to strengthen the weakened elements. Many people just go by the wayside and are never assigned the correct diagnosis. Many physicians don’t look at structural issues. It’s not taught in medical school, and essentially, it’s not there as far as most people are concerned. Most MRIs and radiographs don’t reveal the cause and complete hands-on physical exams are often not performed. In all probability, a large percentage of patients with chronic, undiagnosed problems can have their structural issues treated successfully with a good diagnostic exam and appropriate treatment directed at the indicated problems. 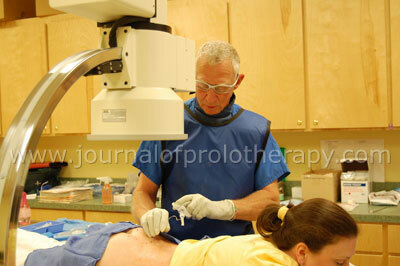 Marc Dubick, MD performing Prolotherapy on the lower back. Hauser: That’s a great explanation. You mentioned in your journey you eventually connected with Dr. Ravin. Can you expand on how you got involved in Prolotherapy and also using human growth hormone and testosterone as a proliferant, and a little about your IRB? Dubick: As I mentioned previously, I met Tom Ravin at my first AAOM meeting in 1994, and we became friends. I spent a week observing at his office, and I began my understanding of the interrelationship of structural issues and their treatment as an important aspect of pain management. Tom has been at the forefront of Prolotherapy for 25 years, is a free thinker, and a real innovator. I began performing Prolotherapy injections in 1995 and have continually expanded my knowledge base and technical proficiency over the last 15 years. I perform all of my injections under fluoroscopic guidance as a carryover from my anesthesia pain management techniques. I treat appropriate patients with Prolotherapy as well as continuing to see other pain management patients who are candidates for other treatments and modalities. Marc Dubick, MD consulting with a patient in his Charleston, South Carolina office. Tom had been considering the use of testosterone as a proliferant for a number of years. We started discussing its use in an injection protocol and we added HGH (human growth hormone) in the theoretical solution along with procaine. Based on many reports in the literature describing the positive benefits of systemically injected HGH in helping speed the healing of serious burns, skin grafts, and fractures, we hypothesized that a localized injection of HGH would also be beneficial. I could find only one study in the literature using localized injection of HGH. The study involved brachial artery injections using a tourniquet and compared muscle mass in the treated arm with the untreated arm used as the control. Muscle mass increased significantly in the treated arm and the serum IGF-1 levels did not rise. HGH is a strong stimulant of protein synthesis, with the effect being significantly enhanced with the addition of aqueous testosterone. Because HGH used in this capacity is an off-labeled use by the FDA, we felt that obtaining Investigational Review Board approval was an important first step before beginning the injections. After a 6 month process, I was awarded an IRB approval from the Roper/St. Francis Healthcare System IRB committee in Charleston, SC for a two year study with 100 subjects. The study started in June 2009, and I am currently treating or have treated 40 patients. The preliminary results have been quite gratifying. I’ve found anecdotally that the areas treated are healing faster, stabilizing more quickly, and patients are reporting less pain than was observed with the Prolotherapy procedures that I perform. I am averaging 3 sets of injections per body area, with minimal discomfort during and after the procedure. A number of patients report improvements very early on during treatment. Each subject will be re-evaluated 12 months following the completion of the injections, and I have not yet reached that timeline. The HGH injections are being performed in every area of the body that I would perform standard Prolotherapy injections. I plan to report the final results of this study, in hopes that others will repeat the process, with the ultimate goal of convincing the FDA to make localized injections of HGH for healing purposes to be a labeled use. Hauser: You would probably say the same thing about using testosterone in the Prolotherapy solution. Dubick: Yes, testosterone is intricately involved with HGH and exerts a synergistic effect, increasing its effectiveness. Testosterone also has a direct stimulant effect on protein synthesis and most probably would exert beneficial effects if used with a glucose based proliferant. However, I have not tried this combination myself. Hauser: Some of the subscribers to the Journal of Prolotherapy are the lay public. Can you please explain a little about what an IRB is and what it stands for? Dubick: IRB stands for Investigational Review Board. An Investigation Review Board Committee is a hospital committee made up of medical, nursing, pharmacy, administration professionals and lay people. It is a committee that has been formally designated to approve, monitor, and review biomedical and behavioral research involving humans with the aim to protect the rights and welfare of the research subjects. An IRB performs critical oversight functions for research conducted on human subjects that are scientific, ethical, and regulatory. In my case, I obtained an IRB approval because of the “off label” use of HGH and because I feel it is important to publish the results of the injection study, as I believe it will show a significant benefit to the study subjects. My IRB allows me a two year study with 100 patients to do these injections. They’re performed under specific criteria and follow up that was agreed upon during the approval process. Hauser: Prolotherapy doctors traditionally treat a wide variety of conditions, including degenerative joint disease. Do you have a feel for human growth hormone/ testosterone combination across the board? Is it more beneficial compared to the traditional Prolotherapy? Do you feel it will have a specific place for certain conditions? Or maybe it is just too soon to tell at this point? Dubick: I’ve used it successfully with patients who have sports type related injuries, degenerative joint disease, overuse syndromes, motor vehicle and work related injuries, and with osteoarthritis. I’m seeing benefit with injections into small joints in the hands and feet. I am adding the HGH/testosterone combination into the knee and hip joints, but only when I am also treating the hip capsule and knee ligaments. I’m using the HGH/ testosterone combination in all areas where I have used traditional Prolotherapy. Thus far, I have seen benefits in all areas that I have treated with the exception of moderate to severe osteoarthritis of the hip. Marc Dubick, MD examining a patient prior to treatment. Hauser: I understand. Is there anything else you would like to share? Dubick: One thing I’d like to touch on is that I am disturbed by the negative publicity surrounding human growth hormone. I am finding the HGH/testosterone combination to be a potent initiator of healing that can have wide-ranging benefits for those suffering from chronic and possibly acute structural injuries. I have patients that range in age from 18 to 91 years old who are benefiting from these injections. The rapidity with which the healing phase appears to begin and the minimal discomfort noted during and after the procedures are two advantages that differentiate the HGH/testosterone from the P2G Prolotherapy that I perform. Adjunctive therapy is also very important, including joint mobilization to maintain normal skeletal alignment and a strong rehab program. Hauser: Those traditional doctors who are not Prolotherapy doctors may say, “What about the side effects of growth hormone?” What would you say to them, as a doctor who does structural medicine? Dubick: From a structural medicine standpoint, I’ve seen no side effects since I’ve been performing these injections. The growth hormone is most probably denatured very quickly after injection. It appears to work on target cells, very possibly the macrophage, but this has not been elucidated at this point. I have not seen any side effects of this localized injection, and do not expect to see a rise in IGF-1 levels following the procedures. Marc Dubick, MD performing Prolotherapy under fluoroscopy. 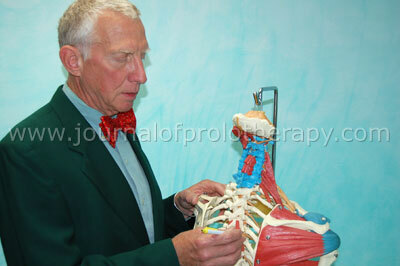 Dr. Dubick explaining treatment, using a skeleton model. The testosterone is an aqueous based solution that is present in the body for several days. The levels rise transiently, but I’ve seen no significant side effects on either men or women. Hauser: If you looked at the package insert of testosterone or human growth hormone, some side effects that might be listed are swelling, carpal tunnel syndrome, and things like that. Would you say there is a maximum dose you would use at one time? Dubick: I use a set maximum dose of growth hormone, and the injections are localized at tendon and ligament entheses. As I mentioned, HGH is probably denatured very quickly, and it is doubtful that any increase in IGF-1 levels occur systemically. The brachial artery study that I mentioned earlier did not show a systemic increase in IGF-1 and I would not expect it to rise with these localized injections. Therefore, I would not expect to see any systemic side effects. To be on the safe side, however, any patients with carcinoma, present or in the recent past, are not considered for these injections. Hauser: Marc, that was a great explanation. Out of curiosity, have you also done some work as far as using growth hormone and testosterone? Not necessarily in the Prolotherapy solution but, creams or shots, to help a person become more anabolic. Dubick: My patients who have low levels of testosterone on lab testing are referred for replacement therapy, primarily with creams, sublingual tablets, or oral drops. Low levels of testosterone are very common in men and women with long standing severe chronic pain. I definitely feel that normal levels of testosterone are important for overall systemic function. I don’t suggest replacing HGH unless the levels are below the lower normal limits, and I don’t really know the significance of lower levels of HGH. Both testosterone and HGH are vital for the initiation of the healing response in the body, and we hypothesized that creating an iatrogenic wound with needling and the flooding of the area with testosterone and HGH would stimulate the healing response even in patients with low levels of these two vital hormones. Thus far in the study, even very elderly patients with low hormone levels, particularly testosterone, appear to be healing very quickly with the HGH and testosterone injections, even faster than with traditional Prolotherapy. Hauser: Do you use certain guidelines for recommending a man or woman start hormone replacement therapy? Dubick: Yes, I do. As I mentioned previously, my recommendations for replacement depend on how low the levels are in serum testing. I recommend testosterone replacement routinely for both men and women, although a greater percentage of women seem to have very low testosterone compared to men. I recommend HGH replacement therapy rarely. Replacement is only by injections daily, and is very expensive. Also, there is significant controversy regarding HGH replacement unless the levels are well below low normal values. Hauser: Dr. Dubick, thanks so much for your time.